Click below to watch this video about the troublesome traits of the self-absorbed partner. You can also click here to read a transcript of the video. As you can see, self-absorbed partners can be quite challenging, but you’re on your way to working with them successfully. And I’d still like to know – do you have a recent example of self-absorbed behavior? If so please share it below. To continue on from here with this series, please click here for parts two, three and four. Hi thank you for the informative presentation. I am not licensed yet, however I’m thinking the self absorbed client may be attached to her/himself due to the possible need to attach to themselves because some level of abandonment issue in childhood. In other words, due to not having needed attachment to parent/s, they attach to themselves as a survival technique. Hence, no conscious awareness of their “behavior” as they have adapted “survival” into their norm. their way with no regard for the thoughts or feelings of their partner. Thank you for these videos. I’m not a therapist, though I play one at home. As the spouse of a very self-focused person, I have felt many of the emotions you outlined, especially lonely, burnt-out. The Dear One has changed a bit, but minimizes the effects of prior actions on his relationships with me, his children, and other family members. i look forward to to hearing your advice for counseling couples with this dynamic. Thank you. Very very interesting! I appreciated the differentiation between narcissistic and self-absorbed partners. Dear Ellyn Thank you so much for this video. I am the lonely spouse in this story, although I have no doubt that if I look deeply enough I will also discover being the self-absorbed spouse at times during our 20 year journey. I am now embarking on further study in mental health. I started writing therapeutically (poetry) to heal when my depression and anxiety brought out not only the worst (and most desperate) self, but also highlighted the deep unresolved issues in our relationship. I am hoping that my poetry will help give a voice to others whose experience I have in some way shared. I have presented at a conference of psychologists and the feedback I received has affirmed for me, with not an inkling of doubt, of the power of the written word to help in the healing and recovery process. I have come out stronger, with a fresh and slowly clearing vision of who I want to be and the legacy I want to leave in my life (and it certainly does not include my depressed ‘self’!). Whether any hope …any scrap of hope,..remains to salvage my marriage (my husband having walked out on me post-depression to pursue his need to become professor) is out of my hands, except to the extent that I can learn to ‘love’ him in his broken state and to ‘respect’ him again after all our trauma (his as much as mine). I would like to share four poems that have been part of my journey in the hope that they may resonate and bring hope and a measure of comfort to others….I hope that they resonates in some way. Thank you again for your video. I am deeply grateful for the continual nourishment that crosses my path..every day. The clock ticks, time has passed so fast – a glance is luxury. You shave, you rinse, you dry your face, your teeth brushed on the run. At times, you stand and look so hard -That pimple plagues your mind! Satisfied that the look is right, not leave the look to chance. That mirror’s only there for you when in your soul it’s yearned. To comfort and to reassure that what it sees it shares. Can you then realise in all this the picture’s incomplete? The things that capture your attention are the needs you always meet. The mirror’s there without condition and truths it does not bend. (what the world will see) – It shows right back what the world will judge and keep. when a friend who cares holds it up for you with a hand that doesn’t shirk. But deep in your heart you must always know that this loving hand’s secure. Do not ask it ‘who’s the fairest one?’ Just be fearless and stand tall. That the God who made you loves you so – It’s this mirror we all share. you will see in this one, nothing short of the peace that never sways. at the pain that’s buried there in hope, of those times we’ve been apart. We become more like ‘ships in the night’ whose faint horn sends me to sleep..
It’s a little niggling voice that begs, in prayer, for you to be ‘released’. that our mirrors soon will again converge and bring healing to our hearts. In your way – yes. irresistible, the lure of its Sirens. More real than my labour pains? that would miss their chance to greet the world? of physical and emotional ecstasy? by living in the present? I should not ever try to pry it from your heart? with love unfeigned and holy? Ambition that knows no bounds…. How much did you get for your soul, my brother? spotted with my name (mostly in invisible ink). what I have seen (with my heart)? Is that what you really intended? Would you be willing to let us share them with clients? Thank you Giselle for this reminder. When self-absorbed behavior exists on the more extreme end of the continuum, other people are definitely objectified. And one culture can objectify another culture. Thank you so much for sharing this lovely video with us Ellyn. One question that surfaces for me after watching it and reading the comments is, at what point does self absorption become emotional abuse, in this context of relationship? As for a theory around what is happening in the men and women who are SAPs, I feel it could relate to the intergenerational impacts of severe power imbalances in our culture, from colonialism to misogyny. It wasn’t that many generations ago that First Nations were considered simply “in the way,” and women, mere chattel. In both cases, there was objectivification and dehumanization. In fact, there are many indicators that this is old framework persists to this day in different ways. This required, and we could argue, requires, a suspension of empathy and respect that we could be seeing play out in our offices. In addition to all of our personal historical influences, we are subject to the influence of culture, and therapy can provide an access to understanding what cultural dynamics we may be replicating in our intimate relationships. This may be done via projection, as perhaps in the example Ellyn cited above, or much more subtly. In any case, much of the SA behaviours we see in our clients, both male and female, could be the psyche’s attempts to protect the self against such wounds, or perhaps relate more directly to the sense of entitlement that colonialism and misogyny, as well as perhaps the hegemonic rebound, may engender. Thank you for this video & I so look forward to the others. The self-absorbed partner is definitely a challenge, both from the tricky waters that one swims in to keep from alienating them & yet getting movement going and from watching for countertransference. I have a client, currently, that I don’t see as a couple, but she mostly focuses on her relationship with her boyfriend. She is still married, but currently separated, and has had the boyfriend for 18 years. for about 15 years he doted on her when she had time. He finally pulled away, a bit, and has another female friend and she is outraged.She has some awareness that she is now experiencing what the boyfriend felt for so many years. The compassion does not run very deep, though, more a reference back to how she does not like being in this position. Very relevant! Often couples present with one partner being self-absorbed or narcissistic, stalling the progress in treatment. One example of such a couple in my practice is the husband who parents the kids without consulting his wife. His wife is often kept out of the loop on the kids’ comings and goings or purchases or trips to various events. This husband also goes off on bike rides or golf games presuming his wife has everything covered at home. He doesn’t see why he “should have get his wife’s permission,” so he doesn’t even make attempts to first find out if she is available, if she might have some other commitment, or if she might need him during that time. He says is basically modeling his parents’ marriage, never imagining that his mother might have been miserable with that “arrangement.” I see it is a somewhat common “arrangement,” but with partners who are not as self-absorbed, they are able to make adjustments in their considerations and communications with their spouses to remedy that particular problem. Hi Ellyn……….this video was very timely for me! I appreciate you sharing your experience with counter-transference…..I have experienced that recently with a couple I am working with. When that happens, I feel a sense of shame, as I realize it’s not professional and as you said, confronting a client when feeling reactive doesn’t work for anyone. It feels great to be validated and encouraged. Thank you! I am taking a lot of deep breaths, feeling very validated and curious about the rest of the series. The partner describe here and the relationship are my own. And, hence, many couples with this dynamic enter my practice – as the universe seems to offer what we need to heal in our own relationships to our practice. I am always amazed that the self-absorbed partner is focused on ‘unconditional love’ – coming from their partner – and totally unaware of how their behavior communicates hostility and disinterest to their partner. The inroads for our own marriage began when my husband attended events by ManKind Project and learned compassion for himself, a concept of integrety and the ability to stand in my anger without losing himself . Then, later when we both began to practice mindfulness meditation seriously we began to develop common concepts and language that became a compass guiding a mutual journey. The basic Buddhist ethical teachings around interbeing and the support we felt from our practice community allowed us each to focus on our own development as human beings and took the heat off the relationship to be the primary growth vehicle. Hence, we have developed stability in ourselves and now the relationship can be a vehicle for joy and growth. My husband is able to notice when he is living in his head and make choices to come into the relationship space and out of his head. He accepts my calling to him if I feel alone. I am enthusiastic to learn how to facilitate a positive shift in this way for my couples. Thanks again everyone! I saw an interesting form of self-preoccupation yesterday. A man who makes very rapid judgments about his wife, perseverates on them and is so sure they are accurate that he never questions himself or her. Thank you Ellyn, this is very interesting. I guess the more one is preoccupied with one’s own thoughts, the more one is at the risk of seeing the other as an extension of oneself. Recently I saw a young couple. The husband was an alcoholic displaying an avoidant attachment style whereas the wife was anxiously preoccupied. Because of their conflictual demands from each other like wanting more space versus wanting more contact, they ended up being in a hostile dependent relationship. The man had attained an opportunity for a postdoctoral education in another country for six months and actually wanted to go alone. The woman thought that might be a good opportunity for herself, too, so decided to go with him. The husband wanted her to stay here to get a job because they were in serious money shortage. I thought both were quite self-preoccupied; instead of showing an interest or curiosity in the other, they were deeply preoccupied with their own wishes and pains. When I introduced them to the I-I, the husband in the inquirer role could not maintain eye contact and his facial expression was showing very clearly that he was (could not) not listening. He was absorbed with his own thoughts. His contact skills apparently were very deficient. I think self-absorption and other-absorption are actually two sides of the same coin. Interestingly the more one is preoccupied, the more one loses oneself. Because there is no meeting between self and other as there are no boundaries. Thank you Ellyn for another way of looking at things. As I thought about your description of spouses, I remembered the many spouses of people with severe depression, alcoholism, drug addiction or other distractions. Over the years I have seen the spouses who sought help through education, self-help programs and counselling grow past powerlessness and loneliness. I am more confident in connecting with them than the self-absorbed person. One example I have experienced is where one partner ignores the requests and preferences regarding dealing with her family of orgin. The self absorbed partner continues to do things as he prefers while disregarding her requests and feelings. An example would be that he invites them to family events where his wife would prefer they not attend. He continues to do this despite her clear and repeated communication of her desires. Moreover he admonishes her. She is as you have described: hopeless, feeling invisible, angry, helpless etc. The couples I have been seeing since I started this program in January have not included a self-absorbed partner. However, I have a patient in my individual practice who is married and quite self-absorbed. He wants to keep his wife of 10 years and also be able to sleep with other women (he hasn’t yet! ), travel to developing countries with his wife as long as she goes along without complaint, and refuses to attend her family events because his time is precious. He is struggling with whether or not to indulge in an affair, and whether or not to stay married (which he deems as an entrapment). Ellyn, you make a lot of sense. I am a non-therapist in relationship with the self-absorbed person you describe. Your description of the spouse in this relationship is a right-on description of me. In therapy, I felt that our couples therapist was not addressing, or maybe not even understanding that, the self-absorption existed. I became disillusioned with therapy, suggesting that my partner needed help and I was wasting my time . . . not very mature or helpful, I know. We’re now separating – a real waste of a long time together. As usual you provide material that is crystal clear, useful, and immediately applicable. I appreciate you! 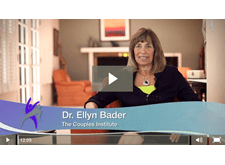 Hi Ellyn………thank you so much for the opportunity to learn more about working with couples who are self absorbed. It’s so true; we are not prepared in grad school to work with couples of this nature. That being said, I love working with challenging couples! My counter-transference can get the best of me at times. I see that as an opportunity to reflect and grow as a couples therapist. I am currently working with a couple who is engaged in the ‘dance of anger’, if you will. She parents him all over the place and he takes no ownership for his behavior. I am starting to believe that the root of the challenges they face is alcohol. She insists she can do without it and focuses on his drinking. He is open about his drinking, yet does not view it as a problem. Most of the time, when they fight, it involves alcohol. It’s as though they are stuck in this dance they do and then come in and ‘whine’ about each other. I’m finding myself a bit stuck with them. Thank you for timely and insightful presentation. Looking forward to the next installment. Two of many things I particularly liked about this excellent presentation…& also find immediately helpful with my couples….are the Engagement Continuum & the list of characteristics for a flourishing relationship. I appreciate the way they each offer not only a framework, but an effective & artful way to (indirectly) confront self absorbed behavior, rather than the inelegant ways I may succumb to out of frustration! Already printed them out to use next week. Thank you, Ellyn, for so generously sharing with us your well organized & clearly articulated thoughts, ideas, & insights! I am learning & look forward to the next one. The next video will be ready tomorrow. Please keep the great comments and dialogue going!!! 2. Not personalizing it -so that they develop the emotional muscle to confront and push growth in the self-absorbed person without blame. 3. Often this partner goes to an angry victim stance. There is enormous growth for both of them that is possible when feelings and desires are openly expressed without anger and when negotiation is requested strongly in areas where they want different things. With the next video I am giving you a continuum of engagement to push growth in the self-absorbed partner. In the session as we were chuckling about the story the husband said “I could see myself doing what he did.” Further discussion opened the door a bit for him to see his self-absorbing pattern. Of course this is why I shared the story. Hope Springs Eternal for us. Thanks so much for this great video, Ellyn. I’m seeing a couple now in which the husband is the self-absorbed partner, although I see it often in wives (as well as in Gay & Lesbian relationships, it does not seem gender-related to me). My biggest frustration in trying to help these couples is the strong move towards defensiveness & blame that tends to happen with the non-SA partner tries to confront (however gently; I utilize both your Initiator-inquirer method as well as the Imago Dialog) the SA partner. No matter what is said, it inevitably leads to the SA partner saying “oh, now it’s ALL MY FAULT” or “Well, YOU do …, and that hurts ME!” etc. The non-SA partner just sits there like “see? this is what happens” feeling as though they cannot even express themselves without it being turned back on them, and as the therapist I feel in a difficult position, knowing that if I don’t do any joining with the SA partner, they may choose not to engage in therapy at all, and yet I do not want to validate their defensiveness. Hopefully this makes sense! It would be very helpful for me if you would address defensiveness and blame in the SA partner in future videos. Thank you for putting together these observations and thoughts! One thing I am wondering is, a self-absorbed partner doesn’t think s/he is self-absorbed, instead they think they are just trying to meet their needs, probably for fear that “nobody else will”. So besides Inquirer-work, which will be great for empathy-building and other-differentiation, learning how to express desires early, honestly, and -most important- appropriately will be beneficial as well, and that can be practiced with the Initiator role. Negotiation tool work could be helpful later to bring home the point that every solution needs to work for both partners. I very much appreciated the video, read some but not all the comments. But was struck that I see many couples who seem to compete in self-absorption and survive together because of mutual win-lose battles. I als liked the comment about non-self-absorbed partners having their own responsibility for their feelings — as part of a system they have their own FOO reasons for their choice, such as one self-absorbed and one victim / martyr parent! Elisa – Glad you are sensitive to the notion of labeling. But sometimes therapists take it too far. For example, giving a label can be a great shorthand way of describing a complex process if it is said as a description vs a judgment. They don’t have the same load on being called passive aggressive as a therapist would because we have sooooo many negative associations to being passive aggressive. If you do two chair work, and you say to the aspiring growth oriented alter ego, “You know the guy in that other chair seems rather self-absorbed and even though he can be giving at times, seems like he only gives when it’s convenient and generally gives with the perspective that he gives to get something in return. This makes the therapy with all the different alter egos go easier and simpler. The key is being descriptive and having the right voice tone and facial expression. Actually we really can’t do any therapy of any length without labeling or judging or evaluating or rendering opinions – even telling someone they are “really optimistic in the face of …” is labeling or making a judgement. Being with a self- absorbed partner is definitely a problem. As you described above. THE problem is how we react to our partner’s stuff and vice versa. We therapists can diagnose the problems and what needs to be done by each person to make things better – that is the easy part. The problem for therapists is that the more distressed, traumatized, dysfunctional the couple the less motivation they have to improve what they do and instead focus on what the partner needs to do differently. Dealing with the problem of little motivation is what separates the really skilled therapists from the ones who mostly let the couples fight under the rationalization of letting them express their pain or try to teach them communication techniques that are doomed to fail. Couples can share or express how they feel or react to their partner’s “stuff” but then the therapist needs to know how to take it deeper for each person. And that is more of an art than science. But the good news is, it is a learnable art. Thanks for the many wonderful responses! I am glad so many of you are engaging with me on this important topic! I have attached a link below for more info. Rob-I especially like how you brought up this comment: “I think that a focus on the self-absorbed, without also sketching out a model of healthy, vibrant self-interest that works well relationally, might bias therapists against clients who are actively engaged in activities and other relationships. They may have each pursued their interests without having good agreements about their interdependence, but that doesn’t necessarily make them “narcissist-lite.” I totally agree with you. I talk about this often as having a high capacity for self-differentiation(the identification of wishes, desires, activities). I believe this is essential in a really thriving marriage. The deciding factor is whether the well-defined partner makes room for the partner’s wishes and desires too. When a partner asserts their desires, do they feel entitled or do they realize they may have a negotiation process to go through that will take them being creative and thoughtful to create a good outcome. I like using the Initiator-inquirer process because it uncovers so beautifully where a partner is on the continuum of other-differentiation. Pete and I will write more comments over the next few days. Thank you very much for this. I can’t wait for the rest of the series. This was very beneficial. This information is excellent. I can’t wait to listen/read about future essays on this subject. Significantly, this article comes at a good time as I work with a man who comes to me with a presenting problem of improving his communication skills with his wife. He describes symptoms and behaviors that reflect the concerns that Ellen presents including the entitlement of his spouse and the effect of her behavior on him and his marriage. It is interesting, that when I do couples work, either spouse can see the other person as the one who is self absorbed. For example, If one wants to watch TV to exclusion of the other, the TV watcher feels that the other is self absorbed because that partner demands too much attention. Figuring this out is pretty tricky. Both partners have to take a look to see what is going on and take responsibility. It is not usually only one partners issue. Yes, Beverly! See my comment earlier. Let’s take a look at the more extreme than the TV watcher. For example, the workaholic, or the partner that likes to spend a lot of time with friends doing things that the partner does not like to do. Is it “bad” b/c this partner has interests that his/her partner does not share. This conflict needs to be worked through to acceptance or divorce, not to change the “offender.” Ellyn, I get confused when you talk about one partner stretching as this seems contradictory to the notion that there is more than one truth. If the “self-absorbed” partner is immature and undifferentiated, there must be other traits about them that the non self-absorbed partner loves/admires that led them to marry them in the first place. Are these factors still relevent for the non self-absorbed partner? Do they outweigh the “negatives” of the “self-absorbed partner?” I put “negatives” in quotations b/c perception is in the eye of the beholder. Someone else might be just fine with these “negatives” and there would be no issue. Oh, Ellyn, help me out, here and correct what I’m missing. At times during this video, I did feel some loss of context. There are so many couples where both partners show a very weak and deficient narcissism, rather than a healthy level of self-interest. They are often sexually withholding from each other, for fear of showing themselves as they really are. Their self-absorption takes the form of a well defended retreat from a more sensual or fully lived life. And it’s often achieved in newer (+/- 5 year) marriages. They are typically poorly differentiated, and mutually depriving/withholding (“control-control”). One variant is the couple that makes everything about attachment & commitment, hiding behind a bland and exclusively “team” approach to marriage. I appreciate this framework and wonder how much our increased absorption with our many devices adds to increasing our own little worlds. I find that parents are much more easily involved with their phones and contacts and less communicative with the family members in front of them. Fantastic video! Thanks! I am currently working with a couple that I believe are affected by this problem. He is thoughtless and judgmental of her, dismisses her feelings as “childish”, and can’t understand why she doesn’t feel the same way he feels. She has been voiceless in this problem for 6-10 years and now is hopeless and just wants out of the marriage entirely. I don’t know if the marriage can survive, but I now feel more encouraged to keep working with them both and have hope that I will learn how to target his self- absorbsion. Thanks again, Ellyn! Looking forward to the next installments. I enjoyed your clear presentation of this fairly common, frustrating problem that couples bring to therapy. I have often found that self absorbed people can come from two ends of the continuum of parenting styles. Either getting too much from their parents, giving them the impression that they are entitled without having to do much and parents who were highly critical, possibly shaming and even abusive. Thank you for this great video! I am very much looking forward to your experience and tools! I have found that self-absorbed partners usually had self-absorbed parents; or one self-absorbed parent, and one doter. The biggest challenge for me is not getting the self-absorbed partner to see how his/her actions are affecting her partner, but getting him/her to see why that’s an undesirable result. In not just one couple, I have noted what I have only been able to interpret as satisfaction in the eyes of the self-absorbed partner. Thanks again, and I am looking forward to more! Thank you for this series, Ellen. Your generosity is so beautiful. In listening to you I became aware of my own counter-transference. I was raised by a narcissistic Mom and a long-suffering, codependent Dad. I notice that I go into helplessness when I get wind of self-absorption or narcissistic traits. I will be very excited to learn from the rest of your videos. Thank you, so very useful. The biggest challenge for me has been to work with couples in which both partners are self absorbed. I look forward to more of you exciting and useful ideas. Hi Ellyn, I didn’t realize, coming into the field, that I would cherish couples work so much! But it has truly become my passion. My favorite example of “self-absorbed partner” is a fairly new couple who came to me from another counselor they had seen for 5 years. They were still struggling, and staying in the marriage, without gratification. As I began to get to know them, they shared with me that they are both fully employed and have a 5 year old son. He (the “sap”) stated that he “contributes to the family fund to pay bills and such, after he gives himself an allowance of $500/month for his play toys”. Each month, when the household budget does not quite, or just barely covers their expenses (and they have a beautiful home and a boat), she must clip coupons or borrow money to pay for their family expenses, rather than he give up any of his “play money”. What concerned me most is that their former therapist of 5 years helped them to negotiate their finances, stating that “he deserved that play money because it is what makes him happy”. I was blown away to hear this story. The wife then explained that their former therapist, whom they stated they loved, was a submissive, passive wife and mother who herself lives in a patriarchal system at home, and she felt that the therapist was interjecting her own values into the marriage counseling sessions. Well, I’ve seen them 3 times now, and look forward to helping them get more on track and find their marriage to be more fulfilling. I can see the husband may be a bit of a challenge, but I feel I am up for the task. I look forward to hearing more from you!! Hi Ellen, your sharing of your history and how it played into your view of the self absorbed partner reall resonated with me. Coming from a big family,struggling with limited resources, sharing,taking turns, helping out with the load were just part of daily life. Working with couples where the balance is so squeed that one partner is chafing under the disregard frequently challenges my objectivity. I am looking forward to learning better techniques then I presently possess. Gorgeous video, and what a fantastic topic. Who among us has not struggled with this issue!? I have a couple I’ve been working with for years in which one partner is totally absorbed in her anger and blame, while the other absorbs himself in activities that separate himself from her. Then both blame each other for being self-absorbed! As usual I appreciate your thoughtful insights into this topic, and look forward to future posts. Good video. Yes, I have worked with these couples, and it’s interesting to notice the different abilities to listen when doing the Initiator/Inquirer exercise. Thanks for this series! Thank you for the empowering teaching, ive learnt a lot. I remember one young couple about to get married, everything was about the young woman, the husband was emotionally detached and withdrawn, she wanted an expensive wedding, there were no funds, always mourning about the husband’s state of finance, on probing she was highly indebted and put under administration/debt counseling, she kept on demanding that they get married in community of property. I am looking forward to more video teachings. I enjoy your work and I thank you for putting such a succinct program together! I am looking forward to learning more and curious as to how it will impact my clients. In particular, those who are equally and radically self absorbed. I know no other way to effectively approach any one, no matter what the pattern, than with compassion. Hello Ellyn, I appreciate your long-lived experience and professional efforts and research on the topic of marriage and couples. I do like the label of the “Self-Absorbed Partner” because the Narcissistic personality traits are generally so negatively construed as adversely unchangeable. The “Self-Absorbed Partner” label is more accurate as it distinctly identifies the mild from the moderate-closer indeed to Severe or Severe Narcissistic traits. The Self-Absorbed Partner is in my opinion being approached from a different perspective as something more rather than less which is a reasonable achievable and hopeful expectation evident in the DSM-IV-TR. Thank you. Thank you, Ellyn, for this very helpful series. I have had two sessions with a couple where the husband had been extremely self-absorbed for the first 10 years of their 14 year marriage, and, according to the wife, has become (relatively) less self-absorbed for the last 4 years. They started therapy because the wife has ” finally found her voice.” She is extremely hurt and angry and harbors a lot of resentment over his past actions, and he switches from remorse to defensive minimization. A few examples that go back to their first years of marriage: he spent their honeymoon playing golf; he arranged to have a neighbor pick his wife up from the hospital after the birth of both their daughter and son; he went on a golf outing over her first Mother’s Day weekend; and when their son accidentally sliced his hand open with a pocket knife, he went off to his meeting, leaving his wife to take the bleeding child to the ER with her young daughter in tow. As the wife recounts these stories, he gets embarrassed and minimizes them by saying “that was a long time ago.” Or, ” I ‘ve already apologized for that, so drop it already.” He is also very affectionate, generous, and complimentary to his wife. Is this self absorption, narcissism, attachment, and/or ??? Ellen, I’m so glad you’re doing this series. Everything you said in this first video resonated with my experience and I’m looking forward to your suggestions. I know they’ll be very helpful. I can relate a recent experience. I’ve been working for over a year with a couple that fits your description to a tee. The self-absorbed husband is starting to realize that he has cheated himself out of pleasure by ignoring his wife’s needs, and that may be a hopeful hook to help him move forward. But in sessions, whenever I pay particular attention to his wife and her story, not even about him or about complaints, but about her own life experience and either needs, sorrows, or accomplishments, he immediately responds by turning his chair toward me and telling me about himself. I have ways to bring the focus back to her, but he will do this again and again. I want him to have more awareness but it isn’t going to work if he merely adopts a behavior because he should, or he wants to impress or please me, which seems to be a primary motive for him in here. I loved your summary of how each partner, the self absorbed and the spouse, experience this dynamic personally and in the context of the relationship. I look forward to the following videos on how to intervene. Seems to me empathy for the “offending” partner is critically important, which poses a risk of alienating the non-self absorbed person. Finesse is an art here. I think giving the spouse reason to hope this can change is also critical. Even where one partner is not overly self absorbed, partners can get into a debate about whose needs/wishes is more important and therefore should have his/her way in a disagreement. I am a counseling grad student fascinated with couples therapy. I recognize my own self-absorption issues, as well as my own depression and loss of self-esteem related to my ex-husband’s self-absorption issues. I also recognize many of the self-absorbed behaviors noted by commenters above. I agree with you – It is too easy to label a person as “self-absorbed” or “narcissistic” without acknowledging that the behaviors are what need labels, not the person. My ex-husband acted in many self-absorbed ways – focusing more on his work and family of origin than on me, our marriage, and our children – but I try to see that his underlying motives were not “bad”, just not effective in supporting our relationship. I see the same in myself – my self-absorbed focus on me as victim was entirely ineffective towards an end goal of a healthy marriage. I am so looking forward to learning more from you and to taking training with you as I grow into my career as couples therapist. Thanks Ellyn. Right on the head. Hello Ellyn. Thank you for this. I often get stuck on labeling a partner, in this case, the label of “self-absorbed” as being a “bad thing.” Wouldn’t concluding that this is a “bad thing” be dismissing the “self-absorbed” partner just as much. The “non self-absorbed” partner experiences their partner as “self-absorbed,” but that experience is theirs to own. As the “inquirer” is supposed to not personalize, isn’t the non self-absorbed partner personalizing by labeling their partner’s behavior “bad?” If a supposed “self-absorbed” person exhibits self-absorbed traits, that’s about them. You can share your feelings about that and how you don’t like it, but to allow yourself to get lonely, depressed, feel invisible, hopeless, feel dismissed is about you. I often get confused here. Very interested in hearing your response and setting me straight if I’m off base here. Thanks, again. you bring up some great questions, elisa and now i’m curious to hear how you, ellen respond. i’m 68 and have been a self-absorbed partner with several different men. it;s taken me 50 yrs of therapy and personal work, failed marriages and relationships and lot and lots of learning, questioning, and crying, to SEE myself. my challenge is to intervene consciously in this habitual unconscious behavior and remember the personness of all others. i feel very optimistic. i’m grateful for these periodic discussions. l learn so much. Ellyn, you put words to so much complexity that I have experienced but couldn’t put my finger on. The self absorbed partner shows up in many different ways, and I have a few examples. The one that stands out the most is a woman who is ready for a divorce/moving out right now, and isn’t taking into account the effect it may have on his son who is moving off to college in a few weeks. I look forward to hearing more of your/others thoughts about this. You just described my last marriage! It was so exhausting and demoralizing to be married to a self-absorbed person. This was a long time before I became a therapist. The phrase about not liking to be inconvenienced hit home. When giving birth to our daughter, he wanted to me to change my calming music to the game as it was a very important game. I have so many more examples. My husband now of 26 years, is loving and kind. I strive to have compassion for my ex. knowing that his SA was based on his FOO. I’m not entirely there yet and I am aware of counter-transference. Looking forward to learning more. I found myself nodding in agreement constantly while watching this video. I do a lot of pre-marital counseling but recently have witnessed two young couples, one of the verge of a divorce, and the other already divorced, after only a couple of years together. In the first, the wife is the self-absorbed one, although she doesn’t see it that way (of course), and in the second, the husband was the self-absorbed one. Neither situation has been comfortable for the parties involved and as you stated, instead of focusing on things to keep that spark alive in the marriage, whether consciously or unconsciously, partners dwelled on themselves and their happiness without ever considering the desires of their partners and did nothing to keep the marriage alive so it is no surprise that both couples grew weary of fighting an on-going and never-ending battle as they struggled to try to please their perspective mates….regardless of what the non self-absorbed spouses did, it never seemed to be enough and ultimately, the marriage ended (or will be ending soon). Thanks Ellen. Right on with identifying one of the most challenging marital issues. From my experience, the self absorbed partner is a distanced. Unconsciously often terrified if engulfment and closeness. Usually the male partner. But I see marriages where the female is the self absorbed partner. When it’s the wife or female partner, she is usually enraged and underneath depressed and fearful. Lacking self confidence. Or in a few rare instances, had gone her own way in retaliation and has had or considered an affair. One woman, age 65, and in a second marriage to a self Absorbed spouse, brought him to therapy when her passionate affair with a younger man ended after two years and she realized how desperate she felt because her spouse never even noticed! Therapy was a last ditch effort because she didn’t have financial resources to build a new life at her age. Looking forward to your next installment. I appreciate so much how you frame a concept and then break it down into parts of the whole. I found myself energetically nodding as I listened to the video. I actually have a new couple–saw them one time on Saturday. she is 61 and he is 56. they have been married for about 20 years. There are no children–this is a key point as they had to terminate a pregnancy in the 3rd year of their marriage due to a genetic defect. This was followed by a series of miscarriages. She is a deputy public defender and I am not remembering his profession although it is in a creative field. She works often until 7 or even 10 PM. He has been caring for the home, meals, etc. She expresses appreciation, and now, owns that she has hidden in her work, not dealing with the myriad of internal pain she carries–and she has assumed he will be there. I educated them about the developmental model and also about patterns internalized early in our lives and how they play out as adults if we are not aware of them. He was taken by this concept of patterns. I suggested they make an appointment for next week, and take the time in between to consider whether or not they–but really he—want to commit to a defined amount of time and explore how they arrived where they are and what and how the relationship might shift. We also discussed the possibility of their living separately for a time while beginning this work–mostly so they each can have space to experience themselves separate from the other. I don’t know what they will decide—I hope he will choose to give it a chance. I feel that this new work you are teaching is so exciting and important, and I will need it to be more effective working with this particular couple. As always, thank you so very much!!!! Thank you Ellyn, for your thoughtful research and dead on description of the self obsorbed Partner vs the narcissistic partner. Working with couples, I find it’s common to see one partner who is self obsorbed or under functioning and the other partner who is over functioning and feeling burned out. I look forward to listening in to your ongoing series on this important topic.